Happy Eostre! May the increasing return of that glorious sun bring a corresponding increase of warmth, light and energy into your own life. Easter is based on a much older celebration (Eostre/Ostara) based on this fundamental recognition of the rebirth of the planet, as it warms from the ever-increasing sun. Have you noticed how Easter doesn’t fall on a regular, predictable day of the month — or even in a predictable month? That’s because it’s a seasonal holiday based on the actual wheel of the year, not just the Gregorian calendar. Easter is always celebrated (take a breath here) on the first Sunday after the first full moon after the vernal (spring) equinox. That’s when fresh green food begins to grow once more; lambs and chicks are born; the sap rises in the trees, and flowers open their lovely colors out of the dead winter ground. Crocus! Delicate purple petals rising from the snow! What isn’t possible right now? Easter: note the similarity with the word “estrus”? All of our beloved Easter imagery — bunnies, eggs, flowers, chicks, baskets filled with green grass nests, Christ rising from the grave to live again — are based on the concept of renewed fertility and possibilities for life. It’s all about birth and rebirth. I began the day with a sunrise ritual created by my pals at Milk and Honey, a goddess gift shop in Sebastopol, CA. (Yes, I was up before the dawn. Me! That’s very unusual: clearly that sun was calling.) Here it is, if you’d like to do something like that too. To acknowledge the balance between light and dark; to revere the growing strength and energy of the Sun who is now strong enough to conquer darkness; to acknowledge the time of new beginnings; to bless new goals and projects; to thankfully reflect on the gifts of fertility. 4 sticks of incense, blanket, 1 hard-boiled egg per person, cauldron & freshly cut flowers. 1. Find a special place outside. Lay blanket on ground with intention of connecting to the earth. 2. Arrange the egg(s), cauldron and flowers on the blanket facing towards the Sun (East). 3. Plant incense into the ground in all 4 directions, beginning with East, then South, West and ending with North to represent the 4 quarters. After incense is in the ground start with East, and moving in the same direction, light each incense stick and verbally welcome and honor each direction. 4. While standing, feel your feet on the earth and allow yourself to feel grounded and centered. Then allow yourself to relax and sit on the blanket. 5. Verbally state the purpose of the ritual. – Hold a flower in your hands and focus on the positive end desire of your goal. -Slowly, pull the petals from the flower and place them in the cauldron while reflecting on the meaning of Ostara. -Repeat with a new flower for each intention and goal you are focusing on. 7. Stand up with your egg and throw it into the air as high as you can and let it fall to the ground. It is said that the higher the egg goes, the better your luck will be! 8. Peel the dirt and shell fragments off of your egg and put them in the pile with the stems. 9. Eat the egg and let yourself become energized with healing and positive energy. It is said that if the egg is eaten at sunrise, you will gain much luck, health and happiness. 10. With your hands dig a hole in the earth in the direction of south. 11. Bury the stems and eggshells. This is an offering to the Earth! Verbally thank her for fertility and the gifts she presents us with daily! 12. Grab the cauldron of flowers and heave the contents upward and outward as hard as you can to bless your new projects, and to return to the Earth that which is hers. Laugh or shout with joy! The season of wonder is now beginning! 13. To close the ritual, beginning with North, going reverse to West, South and ending with East, face in each direction and thank the direction for holding sacred space for you and then release it. At each direction turn your incense stick upside down and extinguish it in the earth speaking, “So mote it be.” (Translation: So may it be). May this ritual bring you exactly the energy you need in the days to come. Interesting that the two most important Christian holidays (Christmas and Easter) were set to correspond with older pagan dates and rituals. Steve, yes. Those early Christians weren’t stupid: they knew the best way to gain buy-in was to just lay their own celebrations over the ones the people were already enjoying. They did the same thing with sacred sites. For example, Chartres cathedral sits directly atop an old Druidic well. You have to wonder how many layers deep the sacred sites go (literally!) There are gods in India so culturally deep that the only thing that survives in prayers are their names; no faces, no known attributes. Isn’t that they case in Israel too? there is a muslim site on a jewish one or vice versa? The Dome of the Rock (as well as the al-Aqsa Mosque), the third holiest site in Islam, is built on Temple Mount in Jerusalem, the foundation built up and expanded by Herod to build the Second Jewish Temple over the remains of the First Temple. The large rock in the Dome of the Rock is where, by Islamic tradition, the Prophet Muhammad stopped briefly on his tour of the heavens and holy sites; it is also held to be the place where Abraham was going to sacrifice his son. I’m not sure if there’s an older pagan temple under the layers of Moslem and Jewish structures, but it wouldn’t surprise me. To further complicate things, the Romans rebuilt the Second Temple that they sacked and “accidentally” burned down during the 70 A.D. siege of Jerusalem, and in a seriously misguided attempt to help the Jews feel more included in the empire, dedicated the new temple to Jupiter and renamed Jerusalem “Aelia Capitolina”. It didn’t help. Happy Eostre/Easter! May your spring bring new energy and light into your life. 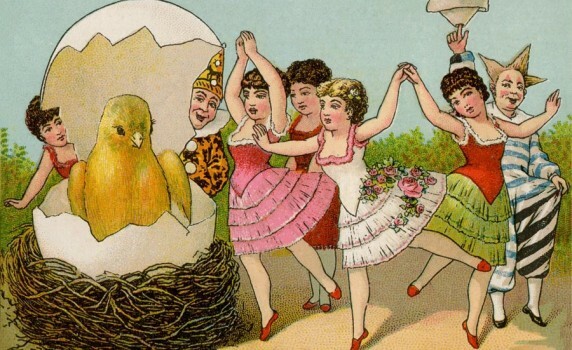 Easter has a very rich and old history. My former professor, the always illuminating Tina Fields, shares wise words about Easter’s history.